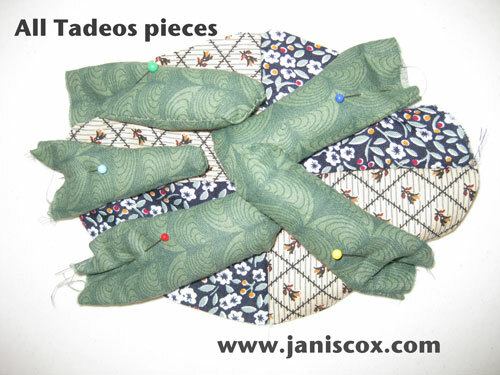 I have been busy making stuffed Tadeos to take to a conference next weekend. I thought you might be interested to see how I make them. I am not a seamstress. 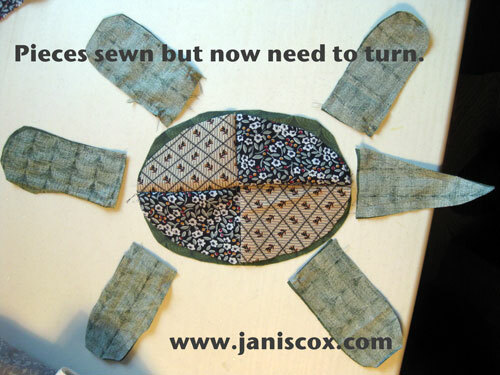 I learned to sew in Home Economics a long time ago and have sewn some things during the years. (Maternity clothes, Hallowe’en outfits, pyjamas, and doll clothes). 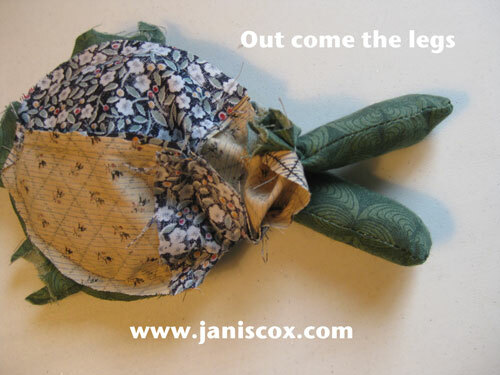 Other than that my sewing is repair jobs, which my husband says takes a long time to happen. 1. 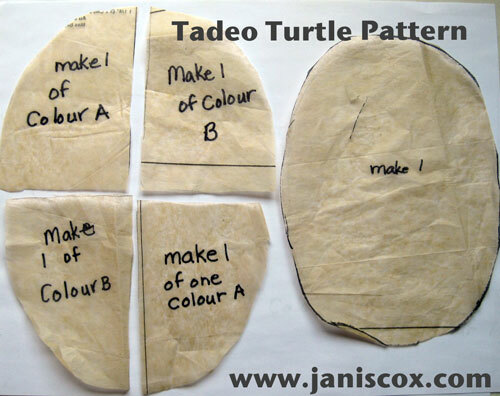 Cut out the pieces using these patterns. 2. 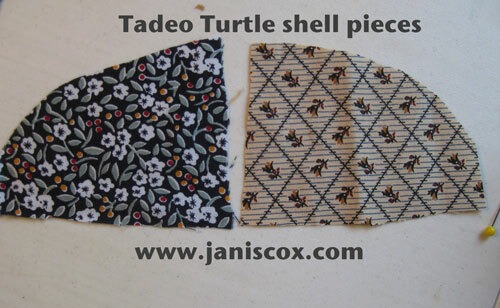 Here are 2 of the pieces for the shell. You will need 4 all together. 3. Pin the pieces together and sew (about 1/4 inch seam). Do that to both sides of the shell. 4. 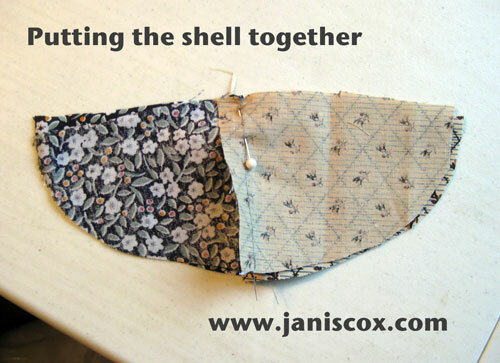 Put both sides together and sew along the top edge. You will now have the top to the turtle shell. 5. 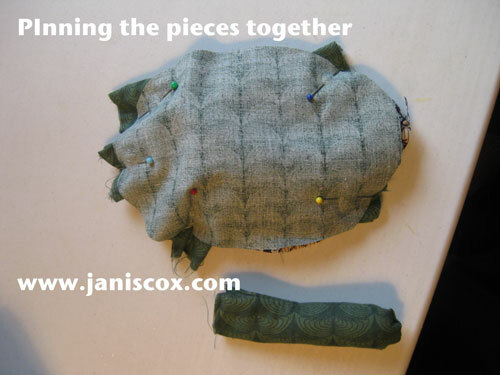 Now continue to sew the feet, the head and the tail, by putting the pieces right side together. This is all the pieces ready to turn right side out. 6. Make sure you turn all the pieces right side out. Of course the head is missing. Then stuff them with cotton batting. 6. Leave out the head. Pin all the appendages inside the shell. Right sides together with the top and bottom shell. 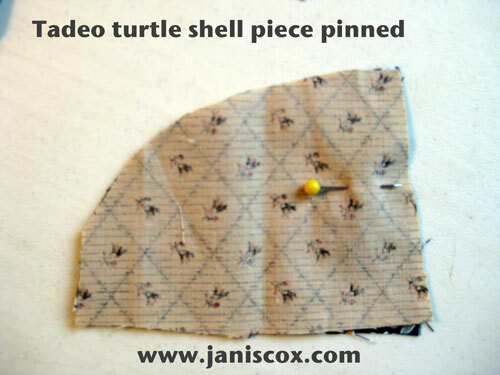 Sew 1/4 inch around the whole turtle but leave room for where the head will go. You can now start the birthing process. 7. The first out will be the front feet, then the back feet, then the tail. Take it slowly and be gentle. 8. Almost born. Continue to pull. 9. Here is the turtle right side out without his head. See the spot left for you to stuff and put the head. 10. Stuff the turtle and place head in the hole. 11. 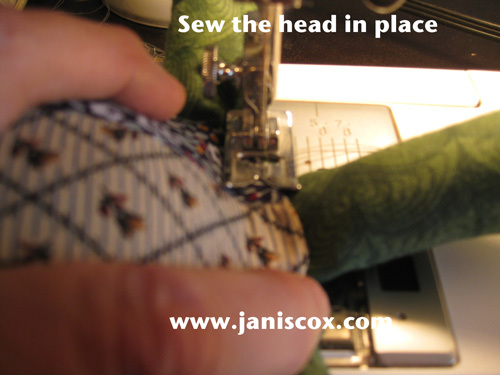 Now sew the head in place. It was hard to hold and take this picture. I also turn the head around and fold it back and sew it again to get it to stand up right. 12. 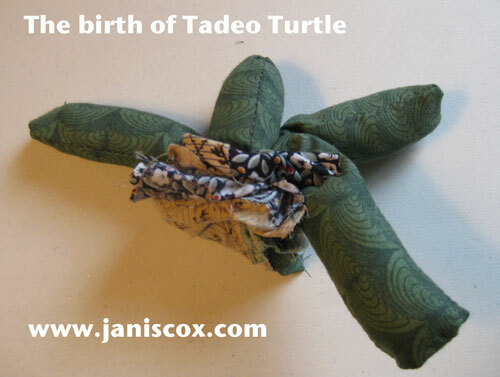 Another Stuffed Tadeo Turtle. Next week I will show you the bale of turtles I have created. 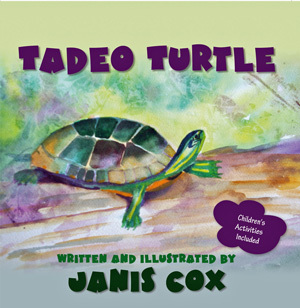 Please check out more about the book Tadeo Turtle on Tadeo’s Page. You will find more activities at the back of my book. And a 24 page curriculum is available if you ask. 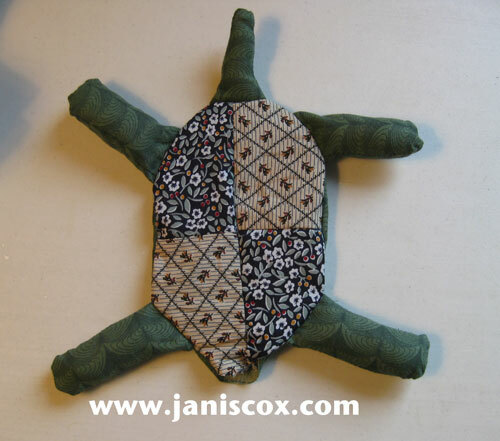 This entry was posted in Creative Saturdays and tagged craft, Crafts, instructions, Janis Cox, sewing, stuffed animal, stuffed Tadeo, Tadeo Turtle on May 18, 2013 by JanisCox. This is so cute and your instructions are great!!! Thanks for sharing on our Bowdabra Saturday Crafty Showcase!! I will be another week before I link as I had a blogging holiday this week. So cute!! I love it. Thank you for sharing at Sharing Saturday!! Oh that came out so great! My mother loves turtles and she would love this. I don’t sew much but I wonder if I could make this by hand. I just love how it turned out! Thanks for sharing on We Made That! 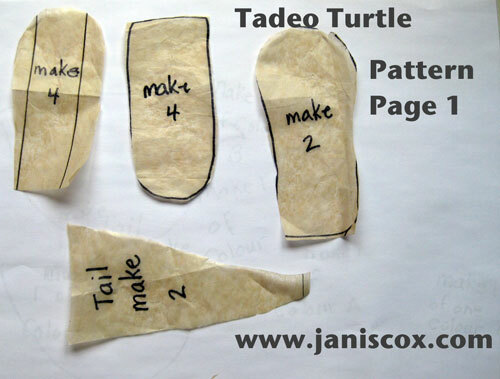 Cute turtle and nice tutorial- you might call it a Turt-torial! Ha! Turtles are my husband’s favorite animal, I’ll have to work on one with my daughter for him! That is too funny. I might use that. Here are my Turtleorials. Hope the instructions are clear. Please email if you run into problems or I need to fix something in the instructions. Wow that is really good, and I love all the step by step photos. If you remember Home Economics – I wonder when it went away? I remember my son learning to sew and cook in grade 7 and 8.